A Premium for Negative Skew? Xiong, Idzorek, and Ibbotson have a new paper coming out in the JPM showing that mutual funds with the highest tail risk (ie, highest probability of extreme downside returns) have higher returns. That is, there's a positive risk premium to negative skew. This is rather curious. The only thing I saw in this field related to this found the opposite. That is, in a 2006 JoF paper, Kosowski, Timmermann, and Wermers, and White bootstrapped the alphas of the entire universe of U.S. domestic equity mutual funds, and found that the top decile had much more positive skewness than the median. The bottom decile had more negative skewness. I don't have the data, but it can't be consistent with both findings. Models get a bad break, and the key is remembering the golden mean: moderation in all things. Macroeconomics, String Theory, Climate studies, all produce highly complicated models that are presented by our best academics as being thoroughly vetted and informative. Yet, for predictions in the real world, they stink. This leads to people saying models are all garbage, and we should all be engineers. Clearly a bad model is worse than no model, but if you are operating in some domain, you have implicitly or explicitly, a model of that domain. in this way, it's simply nice to write it down as clearly as possible to better understand what you are doing. I came across the The Good Regulator theorem (1970) by Roger Conant and Ross Ashby. It is stated "Every Good Regulator of a system must be a model of that system". the theorem shows that, in a very wide class (specified in the proof of the theorem), success in regulation implies that a sufficiently similar model must have been built, whether it was done explicitly, or simply developed as the regulator was improved. Thus the would-be model-maker now has a rigorous theorem to justify his work. I don't really follow the proof, but I think it's definitely true that to regulate something well, you need a good model of that something. It peaks after the Napoleonic wars at 250%, well above the 90% number everyone has been talking about in the US. 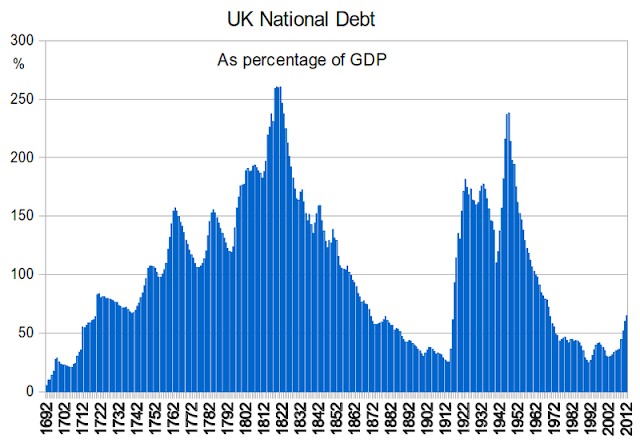 Note the clear decline in debt from Waterloo to World War 1. This is because the government started to perpetually run a surplus (see chart below, taken from here). After the big wars, they would run surpluses regardless of the business cycle. So, was the prosperity from 1815-1914 caused by the debt in 1815, or the subsequent surpluses? Given the debt was used to make war, I don't think we can say it funded the public goods like roads that then generated 1000% returns. I like Kevin Williamson's argument that the US is bound to default, and that's a good thing. Increasing the state doesn't create prosperity, rather, it first takes people out of the productive sector, then increases resentment because people given housing vouchers or make-work jobs know they are low status, undeserving relative to a billion other souls in the world. Better to let people find their way by getting out of the way. A pretty good take on momentum that I hadn't seen (from 2011) here. In our 1927-2010 sample, the two worst months for the aforementioned momentum strategy are consecutive: July and August of 1932. Over this short period, the past-loser decile portfolio returned 236%, while the past-winner decile saw a gain of only 30%. In a more recent crash, over the three-month period from March-May of 2009, the past-loser decile rose by 156%, while the decile of past winners portfolio gained only 6.5%. It looks like immigration reform will eventually grant amnesty to 10 million or so people, in the process encouraging more illegal immigration. I differ with my libertarian friends on this, as I would restrict immigration to those with high skills, like what those evil Canadians do. An essential reference for this argument is Derek Parfit's Repugnant Conclusion. He notes that it seems inevitable ethicists will prefer billions of people barely subsisting to having a mere million people living the epitome of the good life. 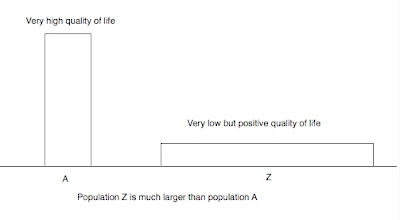 That is, the chart below shows the quality of life on the y-axis, the quantity on the x. There will always be a wide and short alternative that dominates the present, and thus, in the limit we will by moral choice have 100 billion humans living like wild dogs. How can this be? Well consider the following. Say population A contains 1 million people living with an average gdp/capita of $30k/year. Then look at A+, which has that population plus 1 million more earning $20k/year. Clearly, A+ dominates A, because it's just the same thing plus more people, each of whom is presumably happy to be alive. But then, B has 2 million people making $25k/year. This has to dominate A+, because its the same average and total prosperity, plus greater equality. Thus, B, with more and poorer people, dominates A via transitivity. On can extend this ad infinitum, so basically Haiti writ large dominates Iceland or anywhere. I'm a big Johny Hendricks (left) fan, but I think right now among 170 pounders, Erick Silva is the man, Hendricks next, then GSP. Just watch him sneak this triangle choke onto his opponent from last weekend's UFC in Brazil. I couldn't believe Silva didn't fall off because he was so high, but Silva obviously has great leg control. Standing, Silva moves like a cat, and I can't wait until he meets Hendricks after Hendricks beats GSP. For example, one important source of bad decisions is loss aversion, by which we put far more weight on what we may lose than on what we may gain. I don't see loss aversion as being nearly as prevalent as lottery-loving: that is, picking things with small probabilities of big gains, as opposed to avoiding things with potentially large losses. Most really bad investments, those with the lowest expected returns, are things with large potential losses (lottery tickets, horse races, highly volatile stocks, options, penny stocks, etc.) This means people don't avoid them too much, rather, they prefer them too much. But that's only one class of bad investments with large losses. Then there's picking up pennies in front of a steam roller, the kind of trade Kahneman's good friend Nassim Taleb argues is too common, where one basically sells insurance or options too cheap, making money most of the time but then occasionally blowing up and moving on to the next sucker. Kahneman seems highly respectful of Taleb's work, and neither try and reconcile these ideas, even though they are really at the top for both. That makes them more like interesting magazine writers (eg, Carl Zimmer, John Horgan) than scientists. Loss aversion in practice is a curiosity, not common in its domain relative to riffs on its opposite. I think people who love quoting him merely because once you allow irrationality in equilibrium, you are no longer constrained, and Kahneman gives one the authority to do this. So, as much as I enjoy many things he says, I'd say he has been an enabler of sloppy thinking, net net. Yale has a neat website with interviews with people doing research in affect, or moods, and how it affects us. There are interviews with Steve Pinker, Jon Haidt, and Dan Gilbert among others, though I already have heard from those guys, so I like the other videos. For example, Gerald Clore argues that negative moods generate more analytic reasoning. Difficult problems generate negative affect, a reason why people do not like to 'think hard', and why trouble and depression can be a positive feedback loop. American educator John Dewey said you don't learn anything unless you reach a problem, where reality says 'no, do something new.' Positive affect tells your brain, 'you are going in a good direction, and so have no reason to change stream.' As it's improbable we have it all figured out as a child, one should expect periods of lugubrious contemplation because that's the only way you'll really grow. Another reason for moderation in all things (clearly, no one wants to be dyspeptic all the time), a little more Adagio for Strings and less The Magic Flute. Another great clip was by Cosmides and Tooby on the grammar of human arguments, which invariably are about costs, benefits, and mental states. Anger is usually triggered by the perception that someone is putting too little weight on your welfare given your relationship. People get angry when they think they were harmed for little comparable benefit, as if they were merely a pawn sacrificed for some more valuable piece. I remember being quite angry during my litigation in part because many acquaintances who could have helped me a great deal chose not too, presumably because they valued the option for a lottery ticket in dealing with an uber-wealthy guy (or avoiding his negative lottery ticket) higher than helping me, so I got very little help (eg, innumerable facts needed attesting in court by experts, such as that mean variance optimization was not close to Telluride's IP, or simple unwritten rules in IP litigation that experienced people know). If you understand the roots of your frustration, it's less frustrating. There's a reality TV show on restaurants, and it exposed a married couple who ran one restaurant as being especially wicked and incompetent (Amy's Baking Company). The owners responded to complaints on Facebook and showed the world what insolent, self-absorbed idiots they were. Of course, the popularity of this PR disaster has translated into a big success, as supposedly a new reality TV show based on the company is in the works. It's good for regular people to learn through experience that famous people are often jerks or stupid. Perhaps then we will stop listening to their opinions on world events. Over human evolutionary history, upper-body strength has been a major component of fighting ability. Evolutionary models of animal conflict predict that actors with greater fighting ability will more actively attempt to acquire or defend resources than less formidable contestants will....Among men of lower socioeconomic status (SES), strength predicted increased support for redistribution; among men of higher SES, strength predicted increased opposition to redistribution. That jibes with my observation. I guess I'm in the high SES group, generally, and among my weight lifting buddies, I'd say the vast majority are against redistribution policies, much more so than for my neighbors who come from the same demographic. I'd like to think I believe in a smaller welfare state because it's truly the best policy, but maybe I'm just rationalizing self-interest. I think I'm not doing this, but then again, the guy writing this is right now is, in Jonathan Haidt/Michael Gazzaniga's view, just the narrator, the press secretary, of the 'real me', this illiterate part of my brain that has desires and beliefs at one of those Inception-like levels, where I think I'm objectively determining my beliefs, but instead I'm rationalizing a rationalization of a rationalization. If you are worried about the state of macro economics, don't worry, because it's all good. 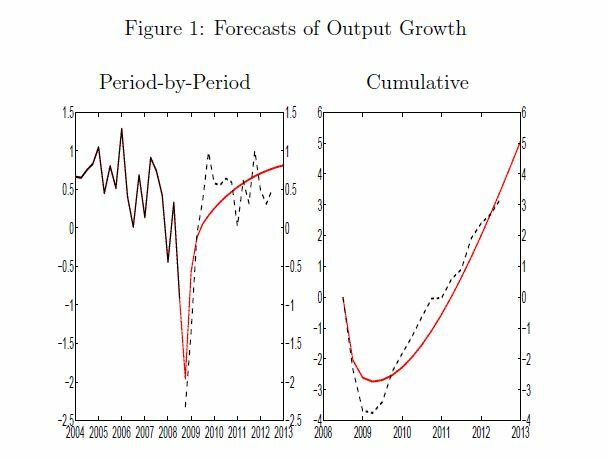 Some New York Fed economists find that a particular DSGE model predicted the 2008 fiasco just about perfectly. This is all 'out of sample', in the same way the test data for neural nets is out-of-sample: if you exclude all the hundreds of functional forms that were tried that didn't work, one of them was fit to only prior data and predicted the out-of-sample data. That is, the projection from 2008 is being done in 2013. The degrees of freedom in this model would make a technical analyst blush. I can understand the allure of this approach (economics is about modeling), but anyone who has been around a while should cop to the patent overfitting that goes on 'outside the model'. I would bet anyone that if they set this model up in real time, it will miss the next turning point...and there will be another DSGE model that would have worked.